A. Speaking generically, Catholics believe in purgatory while Protestants do not. For Protestants, the atoning sacrifice of Jesus is absolute, perfect and final. It had a once-and-for-all quality and, because of it, believers are cleansed, forgiven and declared righteous. To think that any additional purification might be necessary after death would be, for a Protestant, to deny the sufficiency of Christ’s redemptive death and resurrection. This Catholic position builds on the belief of God’s chosen people shortly before the coming of Christ. In the Second Book of Maccabees (12:46), written toward the end of the second century B.C., we learn that Judas Maccabeus “made atonement for the dead that they might be absolved from their sin.” To have prayed for his fallen comrades (who in battle had worn forbidden amulets) showed his belief that the deceased could still be helped by the intercession of the living. In the New Testament, arguably the clearest reference to purgatory comes in Matthew’s Gospel (12:32), where Jesus declares that “whoever speaks a word against the Son of Man will be forgiven; but whoever speaks against the holy Spirit will not be forgiven, either in this age or in the age to come” — a statement that implies there are at least some sins that can be forgiven in the next life. Exactly what this transitional state of purgatory consists in, how long it lasts, whether it might even be instantaneous, are, of course, beyond our reckoning as long as we are on this side of eternity. A. I cannot answer with absolute certainty, since no one is designated publicly as “the pope’s speechwriter.” But I would think that, as with any modern head of state, there are people who assist the pope in drafting his talks. The pure volume would seem to necessitate this; on most days, the pope delivers several talks, particularly on foreign trips when the speeches tend to be lengthier and more numerous. I do know that some years ago when I was working in Rome as a journalist, I learned on good authority that an American monsignor on the staff at the Vatican had been charged with the initial drafts of the talks Pope John Paul II would give on an upcoming trip to the United States. The pope, of course, would edit the talks before delivery, both for content and to impart his personal style to the phrasing. 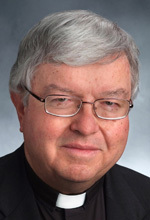 In November 2013, the Italian daily newspaper La Stampa claimed to have identified the newly named “coordinator of papal speech and homily writing,” a Monsignor Paolo Luca Braida, but I never read that the Vatican confirmed this and it would have surprised me if they had. My suspicion is that Pope Francis may have more to do with crafting his own speeches than did previous pontiffs, because Pope Francis’ talks strike me as more spontaneous, conversational and unfiltered. When Pope Francis, for example, just a few days before Christmas in 2014 warned curial cardinals against “spiritual Alzheimer’s,” publicity seeking and the “terrorism of gossip,” those words seemed to come directly from his heart and not from the pen of an anonymous speechwriter.